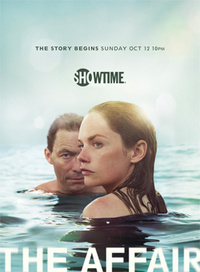 The Affair is an American television drama series created by Sarah Treem and Hagai Levi. The series premiered on Showtime on October 12, 2014. A TV-14 version of the pilot episode was made available online beginning on October 6, 2014, via YouTube, SHO.com, and several other on-demand formats. On November 10, 2014, Showtime renewed the series for a 10-episode second season to premiere in 2015. This webpage uses material from the Wikipedia article "The_Affair_%28TV_series%29" and is licensed under the GNU Free Documentation License. Reality TV World is not responsible for any errors or omissions the Wikipedia article may contain.